— Democrats won the two-party popular vote in the House of Delegates 54.8%-45.2% but carried just 49 of 100 seats in the chamber. — Adjusting for uncontested seats, Democrats won an estimated vote of 51.7% to the GOP’s 48.3% in the two-party vote. According to this percentage and the Democratic seat total, the efficiency gap for Virginia’s district lines suggests a Republican-leaning map, but not an explicit GOP gerrymander. However, taken with results from earlier cycles, the efficiency gap suggests that the Virginia map may be a borderline case of a partisan gerrymander. — There was no statistically significant difference between how men and women performed as candidates in the 2017 House of Delegates elections. After two months of post-election recounts, litigation, and even a tie-breaking draw, the Virginia House of Delegates opened its 2018 session on Jan. 10 with 51 Republicans and 49 Democrats in the chamber. Since the November 2017 election, the Crystal Ball has fielded many questions about the outcome, including queries about why the Democrats’ statewide advantage in the House popular vote did not translate to a majority of seats and whether there was a “reverse coattails” effect. We also received a few questions related to candidate performance, including whether women candidates outperformed men in 2017. The three most relevant versions of these questions boiled down to the following: How should we perceive the fact that Democrats won 49 of 100 seats in the House of Delegates while winning the popular vote in House elections 55%-45%? Did House Democratic candidates help boost now-Gov. Ralph Northam (D) at the top of the Democratic ticket in his race against Ed Gillespie (R)? And did women candidates perform better than men? This article investigates these questions, which involve the House electoral results. One topic of intense discussion has been the popular vote in the House of Delegates. In terms of the raw vote, Democrats won 54.8% of the two-party House vote while Republicans won 45.2% (including other votes, it was 53.9%-44.5%). The fact that Democrats only won 49% of the seats while winning 55% of the two-party vote would seem to indicate a notable Republican gerrymander. But the story is, to some degree, more complicated. GOP critics of using the overall vote point out that 28 Democrats won with no major-party opposition while just 12 Republicans had no Democratic opponent, meaning that there were more than twice as many seats where the GOP had zero votes compared to the Democrats. Clearly, there would have been some Republican House votes in those 28 districts (and some Democratic House votes in the 12 unopposed Republican seats). After all, the GOP won the 60 major-party contested races 53.7%-46.3% in the two-party vote. Of course, it is on Republicans for not challenging more Democrats, though the candidate numbers were a function of the good Democratic environment — with a wind in their sails, more Democrats wanted to be candidates, even in longshot races. However, there is a way to calculate whether the narrow seat advantage the GOP won while losing the House popular vote might be unseemly: the efficiency gap. The product of a paper by Nicholas Stephanopoulos of the University of Chicago Law School and Eric McGhee of the Public Policy Institute of California, the efficiency gap has become more broadly known to the public as a part of redistricting litigation, most notably Gill v. Whitford, the U.S. Supreme Court case addressing Wisconsin’s state legislative map. The efficiency gap is “the difference between the parties’ respective wasted votes, divided by the total number of votes cast in the election.” “Wasted votes” signify votes in seats where a party lost or where it won with “surplus” votes, i.e. more votes than the bare minimum to win (50% in a two-party system). The overall idea is that with single-member district legislative maps, partisan gerrymanders seek to maximize the number of seats a party wins by more efficiently distributing the party’s vote across districts than its opposition’s vote. That means an effective partisan gerrymander should lead the map-drawing party to waste fewer votes than the opposition, predominantly using the two common methods of “cracking” — divvying up one party’s supporters among multiple districts to weaken their influence across those districts — and “packing” — concentrating one party’s supporters in one district to weaken their influence in nearby districts. where “seat margin” is the share of seats won by a party subtracted by 50% and the “vote margin” is the share of the total vote won by a party subtracted by 50% (for an example, I will calculate the gap below for 2017). There are valid criticisms of the efficiency gap as a measure, but it is at least a useful starting place for investigating a partisan edge for one side or the other — though it should not be used by itself as evidence of a gerrymander. In calculating the efficiency gap, the authors note that one of the measure’s limitations is the existence of uncontested races. This is especially important for analyzing Virginia, where 40% of the 2017 House of Delegates contests did not have both a Democrat and a Republican running (actually, that was the smallest number of uncontested elections in recent times — the past two non-gubernatorial cycles of 2011 and 2015 had fewer than 30 contested races apiece). The authors recommend substituting data — imputing — for missing data based on useful proxies for partisan lean. The most obvious proxy is presidential vote by district. While Stephanopoulos and McGhee only used presidential vote by district data for analyzing congressional district plans because they did not have that data for all state legislative maps in their period of study, presidential data for Virginia House of Delegates districts going back to 2008 are available. There were two uses for the 2016 presidential data. First, to estimate party vote share in the uncontested districts, I regressed the 2017 two-party vote margin in the 60 contested seats on the two-party presidential vote margin in 2016 in each district and controlled for incumbency using a categorical variable (0 for no incumbent/other, 1 for a Democratic incumbent, 2 for a Republican incumbent). These controls are necessary because incumbents tend to outperform non-incumbents and because presidential vote is the most useful common proxy for district partisan lean (in 2017’s contested seats, the correlation between presidential two-party vote and the House two-party result was .98, signifying an almost perfect relationship). With the resulting coefficients for these variables, I estimated what the 40 uncontested races would have looked like if they had featured candidates from both major parties, with the assumption that every unopposed incumbent would win at least 50%+1 of the total vote. Second, to estimate vote totals (Democrat + Republican) for districts without two-party competition, the total vote in the contested House races was regressed on the total presidential vote in each district in 2016, which is highly correlated with the House vote in contested races. I then applied the coefficient and constant from that equation to the uncontested seats to produce estimates for their overall vote totals. Having only 60 data points to estimate 40 is not ideal from a sample size standpoint, but that is what is available. I then took the estimated two-party total and multiplied it by the estimated vote percentages for both parties to produce estimated vote totals for each party in the 40 uncontested races. After that, I added up all of the Democratic and Republican votes — estimated in the uncontested races, actual in the contested races — to calculate the estimated statewide vote percentage for both parties. While Democrats won the actual popular House two-party vote by 9.59 points, they won the estimated vote by a much smaller 3.5 points, with Democrats winning 51.7% of the vote to Republicans’ 48.3% (the slight discrepancy between the margin and the party vote shares is due to rounding). Using the estimated vote percentage, the efficiency gap in the 2017 House of Delegates races was -4.5% for Democrats (and 4.5% for Republicans), a figure that suggests the map leaned toward the GOP but not necessarily to an extreme degree. Here are the details of the calculation: Democrats won 49% of the seats, so the seat margin is 49%-50% for -1%. Democrats won 51.726% of the estimated vote when accounting for uncontested seats, so the second part of the equation is 51.726%-50%, for 1.726%. Multiply that by two to get 3.452% and then subtract that from -1% to get -4.452%, which rounds to -4.5%. Based on their analysis of state legislative elections from 1972 to 2012, Stephanopoulos and McGhee recommended an 8% (or -8%) efficiency gap threshold as part of testing for a partisan gerrymander. Another political scientist, Simon Jackman, analyzed the efficiency gap in congressional and state legislative elections from 1972 to 2014 as a part of the Gill v. Whitford case, and suggested a 7% threshold. This result would fall within either threshold’s bound, though again note that the efficiency gap alone does not prove or disprove the existence of a partisan gerrymander. But before Republicans go cheering this finding as evidence that the current House of Delegates map doesn’t operate as a GOP gerrymander — remember that more Democrats voted for the map than voted against it, probably because of incumbent protection — it’s worth looking back to see how this map performed in the three cycles prior to 2017 (2011, 2013, and 2015). Using the same methods described above, I estimated the popular vote in those cycles (though note that these cycles had even smaller sample sizes of contested races). The results are presented in Table 1 below. Notes: *Does not include Del. Lacey Putnam (I), who won reelection to his final term in HD-19 by defeating both a Democrat and a Republican in 2011. However, because there was a major independent candidate (a long-term incumbent as well), I excluded this race while estimating vote share and calculating the efficiency gap. The data show that the efficiency gap in 2013 went beyond the 7% threshold recommended by Jackman and the 8% threshold recommended by Stephanopoulos and McGhee, while the 2011 cycle’s efficiency gap sat right at the edge of both. The map moved inside of those thresholds in 2015 and 2017, but the average was -6.9 for the four cycles. Looking at the average, the measure suggests a consistent advantage for Republicans, one that might be considered unfair. Context also helps to highlight how the more lopsided results in 2011 may have particularly helped the GOP. The first election under the current lines had a number of new districts that drew Democratic incumbents out of their old districts or into ones with Republican incumbents. There is also ongoing litigation over claims that the map is a racial gerrymander, specifically emphasizing the fact that map-drawers chose to draw every majority-minority district with at least a 55% black voting-age population; as race and partisanship are strongly associated, this is something to consider as well. Regardless, the GOP-controlled House had the prerogative to draw the lines as it saw fit (then-Gov. Bob McDonnell, a Republican, was unlikely to veto a GOP-drawn map). Still, along with new lines that packed more Democratic voters into Democratic-held seats, these developments helped lead Republicans to gain another eight seats in 2011 on top of the 59 they held after the 2009 election. To be fair, the GOP was more successful at winning marginal districts than the Democrats during this period. Based on the 2008 presidential vote, Barack Obama won 55 of the seats under the pre-2011 lines; even after redistricting, he still won 51. But importantly, the number of seats Obama carried by at least 10 points in the two-party vote remained the same (40) while the number he won by less than 10 shrank from 15 to 11, with seven of those inside of five points. Republican candidates subsequently won marginally Democratic presidential seats in that 2011 cycle (if a GOP incumbent did not already hold the marginal seat). Functionally, the 2011 result created some new GOP incumbents and cemented others who had won in the 2009 Republican wave, and incumbents are always harder to beat than not (more on that below). These data suggest that Democrats won the popular vote but their gains may have suffered at least to some degree because of the map. However, in 2017, the degree of that Democratic suffering did not surpass two different efficiency gap thresholds that could indicate blatant unfairness. Still, the map had previously shown a larger efficiency gap favoring the GOP in 2011-2013 in the first elections under the new lines. Who had whose coattails, Ralph Northam or Democratic House candidates? Many post-election articles cited the phenomenon of “reverse coattails” when discussing Democratic success in Virginia last November, specifically the idea that House Democratic candidates boosted Northam at the top of the ticket. Before digging into some data about whether or not there were “reverse coattails,” I should define these terms. The “coattails effect” refers to the electoral phenomenon whereby the strong performance of a candidate at the top of the ballot produces a positive effect for other members of their party down the ballot, helping many win, including candidates who may not have been expected to. “Reverse coattails” refers to the opposite effect whereby candidates down the ballot improve the performance of the candidate from their party at the top of ticket (or at least higher up the ballot). There may be a few ways to measure the phenomenon of “reverse coattails” in regards to Virginia’s election. One would be to compare turnout and performance in the gubernatorial race to turnout and performance in House of Delegates races. Josh Yazman, a data analyst, conveniently already did this in late November 2017. He looked at precinct-level data on turnout at the gubernatorial level and how it compared in contested and uncontested House districts. While he found that contested House races produced a 3.5% increase in gubernatorial turnout — which he notes is almost certainly an exaggerated finding — Yazman also found that if gubernatorial turnout in precincts in contested House districts were reduced by 3.5%, Northam’s overall statewide margin would have barely changed (it actually would’ve increased very slightly). Another way to examine this question is to compare the percentage of votes won by Democratic House candidates in contested races and Northam’s percentage. 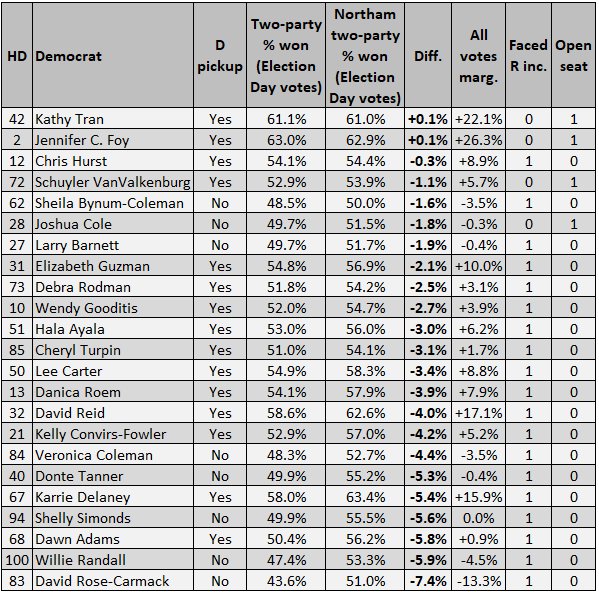 If high-quality Democratic House candidates were helping Northam, it seems reasonable to expect a decent number of them to have run ahead of Northam, possibly allowing them to drag Northam’s share of the vote up as a result. The Virginia Public Access Project has calculated gubernatorial results in each of the commonwealth’s 100 House district based on the Election Day vote (that is, VPAP’s gubernatorial vote by district did not include absentee or provisional votes, which are not broken down by precinct). We can then compare the Election Day results of Democratic House candidates in contested races (Democrat-versus-Republican) to see how voters who showed up to cast ballots decided to vote from the top of the ballot on down. Still, there was some range in the relative performance of House Democratic candidates vis-à-vis Northam. Three Democrats running in districts in the western part of the state (HD-01, HD-03, HD-20) ran 2.0 to 3.2 points ahead of Northam. Three others ran between 0.1 and 0.8 points ahead of Northam. Meanwhile, 20 Democrats ran 0 to 2.0 points behind Northam and 34 Democrats ran 2.0 to 7.4 points behind him. The nature of individual races unsurprisingly affected the results: Democratic challengers facing Republican incumbents ran, on average, 2.8 points behind Northam, slightly more than all Democrats did. Notably, Democrats in open seats did not run exactly one-to-one with Northam, running on average 1.2 points behind the party’s gubernatorial nominee. Had many Democrats run ahead of Northam in districts lacking Republican incumbents, that might have provided evidence of reverse coattails. Even the six Democratic incumbents (of 33 running in total) who faced Republican challengers ran behind Northam by an average of 0.7 points in Election Day percentage, and none of them ran ahead of Northam. This evidence points more to Northam having coattails than his fellow down-ballot Democrats having reverse coattails. An additional way to see why this was the case is to look at the Republican-held House seats the Democrats picked up and the others that they came close to winning, laid out in Table 2 below. Of the 23 contested Republican-held House seats that Northam carried, in only two did Democrats run ahead (very narrowly), and both of them were running in open seats. Republican incumbency surely helped the GOP in many of these races — again, Democratic candidates in contested races ran, on average, 2.8 points behind Northam in the two-party vote, so that means GOP incumbents ran an average of 2.8 points ahead of Gillespie. However, Northam carried 58 districts in Election Day voting, nine more than Democrats won in House races. Had he not won by nine points at the top of the ticket, Democratic gains in the House would have almost certainly been smaller. If Northam’s margin had been cut in half to 4.5 points and the resulting shift knocked the margin of every House Democratic candidate down by 4.5 points as well (remember, 90% ran behind him, so it might’ve been by more), four winning Democrats would have fallen short. If Northam’s margin had been reduced by two-thirds to just three points, and every other Democrat’s margin shrank by six points, seven winning Democrats would have fallen short. In fact, that outcome — an eight-seat Democratic gain — was apparently the mark many Democratic officials hoped to reach this cycle. Now, by focusing on Northam’s coattails, I am not trying to take away from the Democratic House candidates who won in November. They had to choose to run, campaign, and raise money to make credible challenges. If Democrats had not run candidates in 88 seats, they would not have had the same opportunity to capitalize on Northam’s coattails. Democrats ran candidates in only 67 seats in 2013 and 70 in 2009, and in 2017 just 12 Republican incumbents went unchallenged out of the 60 who ran for reelection. To put it another way, elections are decided by those who show up; not only the voters, but the candidates as well. Many of the Democratic House candidates ran against Republican incumbents, too, who likely enjoyed an incumbency edge not present for either side in the open-seat gubernatorial race. Lastly, the Crystal Ball received a few questions about how gender influenced candidate performance in the 2017 House of Delegates elections. While the queries focused on Democratic candidates, I also examined Republican performance. However, there were only 60 contested seats, which is a small sample size. While not ideal, it is what we have to work with. In those races, there were 34 Democratic women, 26 Democratic men, eight Republican women, and 52 Republican men. There were 29 races with a Democratic woman and a Republican man, 23 races with a Democratic man and a Republican man, three races with a Democratic man and a Republican woman, and five races with both a Democratic and Republican woman. Using data from the 60 contested seats (i.e. races with a Democrat and a Republican), I regressed the two-party vote percentage candidates received on gender (man or woman) and controlled for incumbency (in the same fashion as in the estimation process for the efficiency gap), and the two-party 2016 presidential performance in each district. As discussed above, incumbents tend to do better than non-incumbents, and by controlling for the presidential performance, candidates running in seats friendlier to their party do not receive an undue bonus. I ran two regressions — one for Democrats and one for Republicans — and in neither instance was there a statistically significant difference between how men and women performed when controlling for incumbency and the presidential partisan lean of the district. The Democratic regression coefficient did show Democratic women performed 0.9 percentage points better than men when controlling for incumbency and presidential vote, but the p-value was .11, meaning it was not small enough to fall under a common threshold for statistical significance (p < .05). In both regressions, incumbency and presidential vote were statistically significant. I also tried running regressions to see if Democratic women or Democratic men performed notably better or worse against Republicans depending on the GOP candidate’s gender. However, there were no statistically significant findings for Democratic women against Republican women or men or Democratic men against Republican women or men. It is understandable why questions about gender are popular following the 2017 election results. Overall, of the Democrats’ 15-seat gain in the House, Democratic women won 11 of them, greatly altering the gender makeup of the House. 1. I also used Simon Jackman’s assessment of the Wisconsin state legislative districting plan (part of the evidence for Gill v. Whitford) as a guide for how to estimate, as well as Andrew Gelman’s methods for handling missing data in R. Thanks to Eric McGhee and Sean Trende for their help with questions about the efficiency gap.